--From the SNES Final Fantasy Mystic Quest instruction manual. 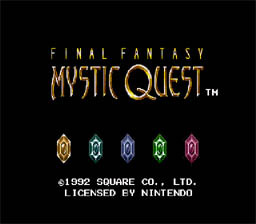 Play Final Fantasy Mystic Quest Now! Save your world from evil by retrieving the four crystals and reopening the Focus Tower. Mystic Quest has improved the way you engage in battles. No more random encounters. You see the monsters from a distance and can choose whether or not to engage them. I think that way is more realistic. I realize you could be walking along and sometimes you would come across a sneaky monster that gets the drop on you, but not every one. I also liked the ability to jump and use your weapon on the main screen. It kinda gave it a "Zelda" mood. You could use bombs and find secret passages and other hidden things. The controls were a little complicated so go here. At the beginning of the game, at the first forest, there is a treasure box containing potions. Take the potions and leave the forest. Now go back to the forest and the box will be full of potions again! Repeat this process until you have as many potions as you want. You can do this in any town, forest, dungeon, etc. that has a treasure box with any healing item in it.